Infant on the second postoperative day. The Silastic patch is sutured to the fascia. Hypothesis Newborns with congenital diaphragmatic hernia (CDH) have a high risk of mortality, ranging from 50% to 70%. Tensioned closure of the narrowed abdominal cavity is detrimental. Patients and Methods Twelve high-risk newborns underwent operation for CDH. To achieve tension-free closure of the abdominal wall, a Silastic patch was used. The Silastic patch was sutured intermittently to the edges of the abdominal wall fascia with absorbable sutures and left open to the air. The skin was not closed above the Silastic patch, which was lubricated with 1% gentamicin sulfate ointment. Results Eleven patients (91.6%) survived. No local or systemic septic complication occurred. The abdominal wall was gradually closed, and total closure was achieved within 4 to 6 weeks (mean, 4.9 weeks). Conclusion Because of the high survival rate and the complication-free rapid healing of the abdominal wall, the technique can be used in any case of CHD in which tension-free closure of the abdominal wall cannot be achieved by other methods. 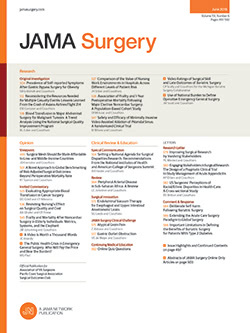 In newborns with congenital diaphragmatic hernia (CDH) (Bochdalek hernia), the mortality rate remains high, ranging from 50% to 70%, despite the improvement in neonatal care.1-4 Whether the recently introduced extracorporeal membrane oxygenation improves the survival rate is still questionable.5-8 Despite proper correction of the anatomical defect, these neonates die of pulmonary hypoplasia in one or both lungs or from development of persistent newborn pulmonary hypertension. Primary closure of the narrowed abdominal cavity increases the intra-abdominal pressure, resulting in increased airflow resistance and diminished pulmonary compliance. The use of an abdominal wall patch prevents these sequelae and improves postoperative survival, as demonstrated by our previous9 and present experience. During 1986-1997, 12 newborns with CDH were treated in our hospital. They were all term neonates weighing 2.3 to 3.5 kg, except for one, who was born prematurely (35 weeks). Associated congenital anomalies were as follows: jejunal atresia (1), gastroschisis (1), and omphalocele (1). The first 5 cases were previously reported.9 All of the cases were considered high risk, as their diagnosis was made in the delivery room or within 5 hours after delivery.8 The diagnosis of CDH was based on the association of respiratory distress with a scaphoid abdomen and a decrease or absence of breath sounds on the side of the hernia. The diagnosis was confirmed by chest x-ray. All of the newborns underwent immediate endotracheal intubation and insertion of a nasogastric tube. Conventional mechanical ventilation was initiated with inspired oxygen concentration of 0.6 to 1 to keep oxygen saturation within the limits of 85 to 95. Within 1 to 3 hours after the diagnosis was made, all of the patients underwent surgical repair as previously described.9 In 9 cases, the CDH was located on the left side, and in 3 cases, on the right. All of the diaphragmatic defects were primarily closed except for one case, in which a mesh patch was used. To achieve tension-free abdominal closure, a 1-mm thick silastic patch was sutured to the edges of the abdominal wall fascia with intermittent 3-0 Dexon or Vicryl sutures (Figure 1). Thoracic drains were not used for the last 9 cases. The wound was dressed with 0.1% gentamicin sulfate ointment. The jejunal atresia was repaired with excision of the dilated and of the proximal jejunum and connected to the distal bowel of the atresic jejunum with end to diasonal and adapted to the diameter of the proximal bowel. After anastomosis was performed, the CDH was repaired as previously described.9 The gastroschisis and the omphalocele were repaired in the same manner. After repair of the CDH, the patch was sutured to the fascia, and the covering layer of the omphalocele was excised, with the intact skin left around the patch. Postoperatively, for rapid frequency (60 breaths/min) and low respiratory pressure (30 cm H2O), mechanical ventilation was used to avoid hypoxemia, hypercarbia, and acidosis. The patients were treated with intravenous pancuronium bromide (0.1-0.3 mg/kg) and fentanyl (10 µg/kg per hour) for 2 to 4 days after surgical repair of the CDH. They were supported with parenteral hyperalimentation until administration of oral feeding was possible. Nasogastric alimentation was administered as soon as the patients' general condition was stabilized, and the bowel coutures could not be seen around the fifth or sixth day. Close observation of the abdominal wound revealed the appearance of an opaque layer on the abdominal side of the Silastic sheath by the fifth postoperative day. This represented formation of a new peritoneal tissue layer. The abdominal wall defect was gradually closed beneath the Silastic patch, which was eventually rejected. Total closure of the abdominal wall was achieved within 4 to 6 weeks (mean, 4.9 weeks), and the newborns were discharged home immediately after closure occurred. Eleven of the patients (91.6%) survived. One patient, already compromised by a very poor respiratory system before the operation, died a few hours after surgery. All of the survivors were weaned from the ventilator within 4 to 14 days (mean, 7 days). Oral nasogastric feeding was begun 11 to 16 days (mean, 14 days) after surgery. Blood cultures were negative in all of the patients. No abdominal wall infections were noted. All of the surviving patients were free from complications following surgery. During the follow-up, ranging from 1 to 11 years (mean, 6 years), none of the patients developed an abdominal wall hernia. One of the characteristics of newborns with CDH is a scaphoid abdomen. After release of the hernia content, primary closure of the abdomen without excessive tension is impossible. An attempt for primary closure may cause deterioration of the respiratory state after an apparently successful operative procedure. This might be the reason that Sakai et al10 demonstrated worsening of thoracic compliance following early repair of CDH and advocated operative delay. On the other hand, Wilson et al8 found that delayed repair and preoperative extracorporeal membrane oxygenation does not improve survival in high-risk CDH patients. It is quite possible that the degree to which lung compliance is compromised may not be dependent on the timing of the operative procedure8-12 but on the technical aspects of the repair, such as the tightness of the abdominal wall closure. A tight closure of the abdominal wall diminishes pulmonary compliance. This may lead to deterioration of the already compromised respiratory state and cause irreversible pulmonary damage. The use of a Silastic patch, if tension-free closure of the abdomen is not feasible, can prevent this sequela, as demonstrated by our experience, and result in an excellent survival rate. All of the newborns who survived the very early postoperative period were successfully weaned from the respirator within a short period. This technique also resulted in early initiation of nasogastric feeding and did not prolong the hospitalization. In summary, our experience demonstrates that the use of a Silastic abdominal wall patch after repair of CDH results in an excellent survival rate, a shorter period of respiratory assistance, and early initiation of nasogastric feeding. This technique does not prolong hospitalization and does not cause significant complications. Corresponding author: Chaim Chaimoff, MD, Department of Surgery A, Rabin Medical Center, Petach Tiqva, Israel. Accepted for publication September 29, 2003. We thank Judy Brand for her English editing, word processing expertise, and contributions.